Frozen foods are the stars of the convenience food world. Take some time to browse through the freezer section in your local grocery store and prepare to be amazed. There are so many wonderful ingredients stocked in the deep freeze. And you can cook them straight from the frozen state! That means all you have to do to make these wonderful and delicious recipes is combine some frozen foods with canned or fresh ingredients and add heat. The food thaws and heats/and or cooks beautifully. Meat stays more tender when cooked this way, and vegetables keep their wonderful bright color and crisp tender texture. Keep your fridge stocked with the ingredients needed for a few of these recipes and you'll never have to order takeout again, no matter how tired you are at the end of the day. Feel free to substitute your own favorite ingredients for the ones listed in these recipes. You can use chicken instead of salmon in the Salmon Chowder; use chicken meatballs instead of beef meatballs in Meaty Hash Brown Potatoes, or use ravioli in place of tortellini in Tortellini Simmer. Enjoy these easy recipes. My old standby! I've made this recipe without meatballs, with meatballs, with cooked chopped turkey and chicken, with ham, and with flaked salmon. It never fails. Just five ingredients make a wonderfully hearty casserole that will warm you down to your bones. I love the combination of flavors and textures in this winner. You don't have to reserve turkey for Thanksgiving. Cook a frozen turkey, unstuffed, for pounds of moist and tender meat you can use for sandwiches, casseroles, and soups. This is the best way to get lots of turkey for almost no work. This fresh casserole uses frozen tortellini and frozen peas, along with Alfredo sauce and canned salmon to make a quick and healthy dinner everyone will love. Tender chicken is coated with flavored bread crumbs and baked on a creamy potato base. This is true comfort food. This easy recipe starts with frozen chicken breasts. They stay moist and tender when cooked this way in the slow cooker. Frozen meatballs cook very well in the slow cooker. I love this recipe because it serves a crowd with very little effort. I love pierogies; those large stuffed pasta half moons are perfect for any recipe that calls for ravioli or tortellini. Mac and cheese is different and delicious when made with potato stuffed pierogies. Yum. 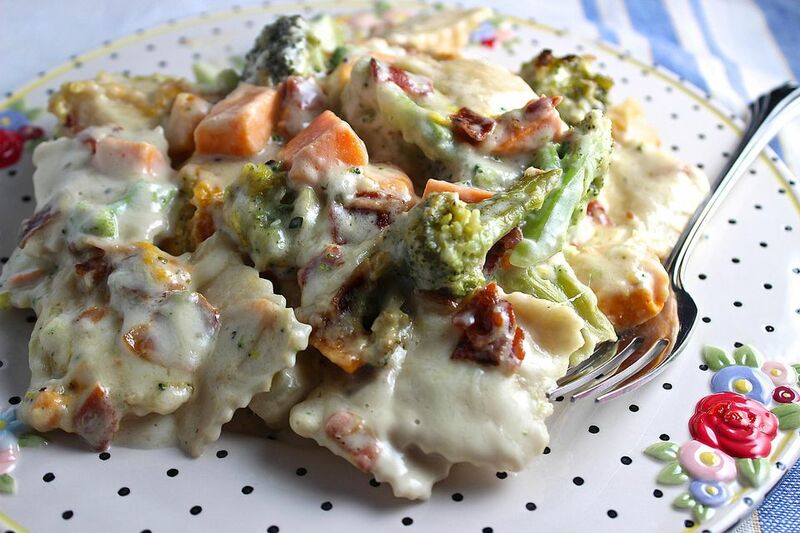 Any frozen vegetable combo is great in this easy recipe. I'm always on the lookout for new combinations.